If you are searching for a gift for a wife, girlfriend, sister, mother, aunt, cousin or other female in your life, here are a few suggestions. For the woman who likes to cook and enjoys being in the kitchen, get her a Microplane grater. She’ll love it. The first time I used this was to grate lemon rind. It melted me in a puddle right on the kitchen floor. The smell is beyond divine. Microplane graters should be a required piece of kitchen equipment. Seriously! This can opener from the Cooking Institute of America is fabulous! It opens cans like nobody’s business and leaves a smooth edge. I absolutely love it. I’ve tried just about every kind of can opener you can think of from the clunky electronic versions to the metal do-hickies you can grab for a dollar to the expensive “best ever” can openers from specialty companies. This one beats them all hands down! Give her some candles to scent her home. You might want to have some inkling of what scents she prefers – berry, fruity, spicy, woodsy, floral. These things are important to know. Someone who prefers spicy scents isn’t going to be wild about a floral candle. Two of my favorite places to buy candles are Bath & Body Works and Yankee Candle. Lotion and bath sets are always welcome gifts. Again, you might want to have some idea as to the type of fragrance she likes. Two great places to get quality lotions are Bath & Body Works or Camille Beckman. You can’t go wrong with a box of quality chocolates. 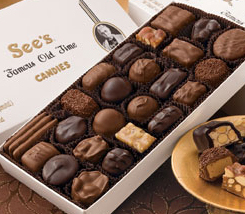 Sees is an excellent choice as well as decadent truffles from Sweet Shop USA. If you are buying her chocolates, make sure there is no presampling from the box or quality control measures going on. She should receive the box with every piece included. If she wants to share is up to her! Give her a cozy robe, soft socks or warm slippers. Wrapping her up in snuggly comfort is a great way to show how much you care. Look for a microfleece or plush robe for the cuddliest fabric. Captain Cavedweller bought me a microfleece robe a few years ago and I love, love, love it! Gift cards are also a great gift if given with thought. If she would love a massage but would never treat herself to one, give her a gift certificate for a spa day. An avid reader would appreciate a gift card to a local bookstore or try Amazon or Barnes & Noble. If she’s been running like crazy through the holiday season, give her a night out with a gift certificate for dinner and a movie for two. Think about the recipient and the types of things she enjoys, her hobbies and passions and you’ll find the perfect gift! That grater works wonders on hard Parmesan cheese. It will do a number on your knuckles, too, if you aren’t careful!